When associate professor Stephanie Majewski of the physics department and her colleagues were planning the upcoming Northwest Regional Conference for Undergraduate Women in Physics, they were not overwhelmed by interest in the event. They were greatly overwhelmed, with well over 200 attendees flying in from colleges across the northwest. “I don’t think I’ve ever seen that many female physicists together in one place.” Majewski said. Majewski attributed the increase to a growing number of women entering STEM — science, technology, engineering and math — fields and an increasing sense of community among female undergrads currently in those fields, which has led to a virtuous cycle. One goal of the conference is to build on that sense of community, Majewski said. As part of the conference the Physics department held it’s wildly successful ‘Physics Slam.’ The event, which was open to the public, drew a crowd of well over 600. 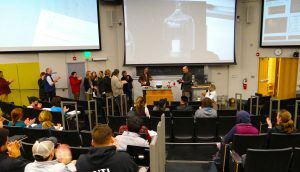 The event challenges six UO faculty members to explain their complex research in 10 minutes. Faculty members from the UO School of Music and Dance and the arts and Physics departments came together to create “Tesla: Light, Sound, Color,” a stage show about this oft-misunderstood Super-inventor Nikola Tesla. The idea for “Tesla” began with Garner; John Park, a senior career instructor in the Department of Art; Jeremy Schropp, also of the Department of Art and who earned a doctorate in music composition and theory at the UO; and Jon Bellona, an instructor of audio production at the music school. The four men comprise Harmonic Laboratory, an artistic group that, among a range of other programs, holds performances and workshops incorporating multiple expressions of art. But the group wanted to incorporate a strong science element into the show, too, in part to reach a broader audience. So they pulled in Stan Micklavzina, a senior instructor in the physics department. “I’ve always had this idea of physics and performance, where people are going to come and see the performance, but then you throw the physics in with the performance,” said Micklavzina, who is popular in his own right for his high-energy physics demonstrations. The group created a 90-minute show that includes dance, an original score, animation, science demonstrations and more. They will perform Jan. 10 and 11 at the Hult Center in Eugene, and then head to Portland on Jan. 13 and Bend on Jan. 15. Bringing a group together with such a diverse mix of skills to tell Tesla’s story makes sense, Micklavzina said. The UO Physics department congratulates senior Physics major, Gino Carrillo, for his superb research presentation recently delivered at 2017 SACNAS: The National Diversity in STEM Conference in Salt Lake City, Utah. At the conference, the judges recognized Gino Carrillo’s work, titled “Electron Interferometry: Transforming the Transmission Electron Microscope into an Electron Interferometer,” as a standout among the student presentations, and selected Gino to receive one of the 2017 SACNAS Student Presentation Awards. Gino’s UO Physics advisor is Ben McMorran. SACNAS is a society of scientists dedicated to fostering the success of Chicano/Hispanic and Native American scientists—from college students to professionals—to attain advanced degrees, careers, and positions of leadership in science. This year, the National Conference gathered about 4000 students and professionals. Taking place over three days, the conference showcased both undergraduate and graduate student presentations, offered scientific symposia, keynote addresses, professional development sessions, and a grand exhibit hall in which students interacted with over 300 exhibitors representing colleges and universities across the nation. The UO LIGO team played a major role in today’s announcement of the observation of a binary neutron star merger — see Around-the-O. In addition to the gravitational waves, the event GW170817 was accompanied by gamma-ray burst GRB 170817A and a large range of other observations from the electromagnetic spectrum, including the signatures of heavy element synthesis. Several journal articles on the gravitational wave observations were published today in conjunction with the press conference in Washington DC. At least 38 separate papers were also set to appear today from astronomical observers. 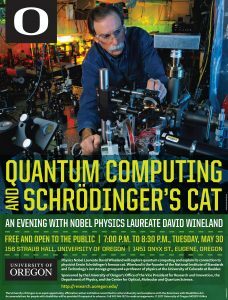 Nobel Laureate David Wineland will join the UO Department of Physics as a Knight Research Professor in the fall. He will work closely with the Oregon Center for Optical, Molecular and Quantum Science and help mentor students and young faculty in the UO’s physics department. 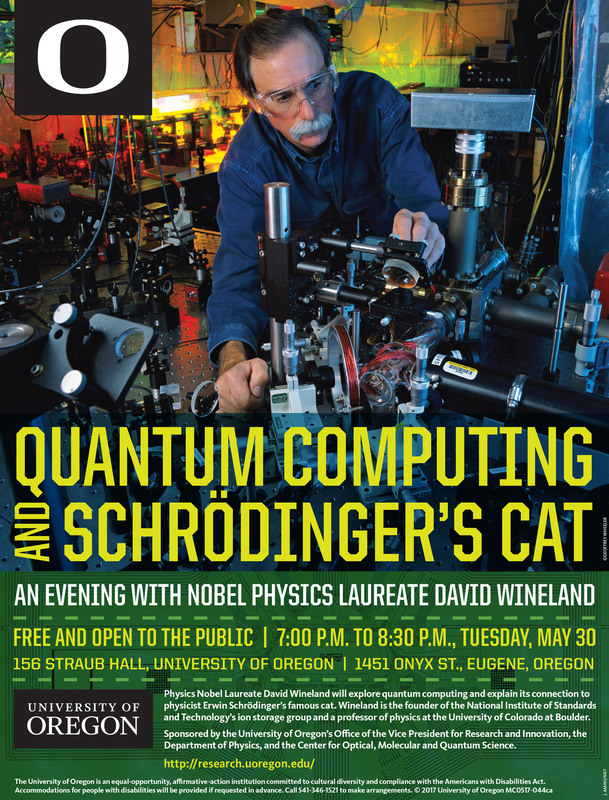 Physics is co-sponsoring a public presentation by Nobel Laureate David Wineland on May 30 at 7PM. Read all about it here. Note that the public talk is in addition to the Physics Colloquium that Dr Wineland will be presenting at 4PM that day. With the availability of spectrally pure lasers and the ability to precisely measure optical frequencies, it appears the era of optical atomic clocks has begun. In one clock project at NIST we have used a single trapped Al+ ion to make a clock based on an ultraviolet transition. With single ions, uncertainties in systematic effects are smallest, reaching a fractional frequency error of Df/f0 = 8.0 x 10-18. At this level, many interesting effects, including those due to special and general relativity, must be calibrated and corrected for. An all-star team of UO experts representing five scientific fields is developing a novel implant that may one day restore sight lost to retinal diseases well enough to read, drive, and see color. Professor Taylor says this work builds on the UO’s 60-year tradition encouraging scientists in different fields to join forces. It also provides a glimpse of things to come from the UO’s new Phil and Penny Knight Campus for Accelerating Scientific Impact, whose mission is to make new treatments and technologies available as quickly as possible by applying a practical focus to insights gained from fundamental research. Congratulations to Scott Fisher for receiving the 2017 Tykeson Teaching Award for Natural Sciences. His class was interrupted on Feb 22 by Associate Dean Hal Sadofsky, who presented the award. He was accompanied by CAS and Physics staff, and faculty colleagues and students from Physics (see photo). The Roundhouse Foundation, a Sisters-based philanthropy dedicated to celebrating and raising community awareness of the arts in Sisters and Central Oregon gifts almost $90,000 to PMO. A contribution that will help expand public outreach and educational programs at the 6,300-foot mountaintop observatory, improve access for undergraduate students conducting research at the site and upgrade key astronomical equipment.